While poring over the source materials for the Geographica family, I couldn’t help but admire the elaborate roundhand penmanship of British engravers working 250 years ago. I found myself studying other examples of such handwritten excellence, among them the maps of Emanuel Bowen (1694-1767), Geographer to King George II, as well as English and American trade cards of the period. The result (six painstaking months later) is Geographica Script, an elegant roundhand simulation steeped in 18th-century sophistication. Beyond its hundreds of alternate letterforms and flourishes, the font comes with fifty elaborate ornamentscrowns, beasts rampant, maritime creatures, and more. 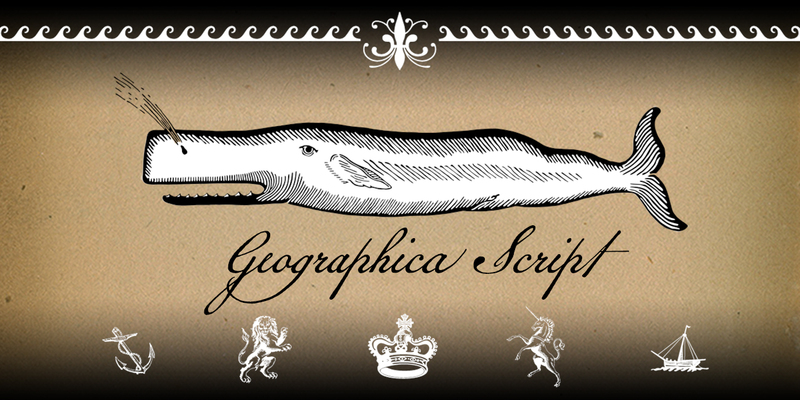 Geographica Script should prove useful in formal invitations and announcements, wine labels and other packaging, or to simulate antique script. OpenType features include three-plus uppercase alphabets, scores of ligatures (for cursive and/or period authenticity), lining and old-style figures, and full Latin support1,100 glyphs in all. US$39.